bl.uk > Online Gallery Home	> Online exhibitions	> Asia, Pacific and Africa Collections	> Darjeeling. A street scene. 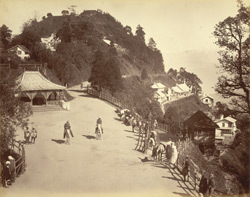 Photograph, with a view looking towards the bandstand at Darjeeling in West Bengal, taken in the 1880s by an unknown photographer, from an album of 62 views of India and Ceylon. The majority of the prints in this collection entitled 'Album of views of India and Ceylon' are unsigned, however the Darjeeling views may be the work of Johnston & Hoffmann as the company maintained a studio there. Darjeeling in the Eastern Himalayas is built on a long spur projecting northwards like a letter Y from the Senchal-Singalia mountain range and descends the hillsides in a series of landings. From 1835 when the British gained possession of it, Darjeeling was the summer resort of Bengal. Tea-growing was introduced here and it is surrounded by terraces of tea gardens.